pride | "Tom in Thailand"
T.I.T. 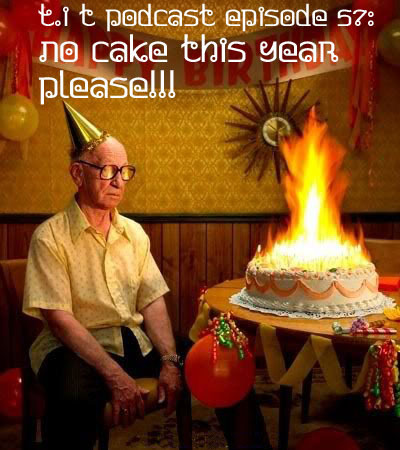 Podcast Episode 57: No Cake This Year Please! Thanks sooooo much for all the well wishes! What did Tom do for his birthday? Tom has just lost it….or at least that is how I feel! If in doubt….always walk away! Making lemonade when life gives you limes! Check out Cocktails and Creampuffs! Love between 2 people = marrying a goat? We’ve a long way to go! Closing remarks and love to my listeners! Email me at tominthai@gmail.com, please go Comment on my page or call my voice line and leave me a voice comment for the show! Good morning, afternoon, evening or night depending on where and when in the wide world this finds you. It is a quite, subdued Sunday morning here in steamy Bangkok, and all I can hear is the sound of the air conditioner and some soi dogs barking in the distance. I’m sitting here contemplating things to write about as I finish a yummy bit of raspberry jam on toast and a coffee flavored with caramel creamer…(Yes, I have a sweet tooth). I actually feel like turning on a bit of Jazz music to accompany my Sunday morning, but our house guest is still asleep and I’d hate to be inconsiderate, being the good southern boy that I am. Anyways, enough ramblings about my life and on to the topic I wanted to write about today. I actually had quite the humorous story to tell, but I think I’m going to keep that for another day. Now, I ‘VERY’ rarely dive into politics here on my blog, as I was raised to think of politics as a very personal thing. We were always taught that one’s politics where no one else’s business and to this day I rarely enter into meaningful political conversations aside from the occasional barbed comment or two with my family. Sooooo, to the small amount of right wing Republican readership I wish a wonderful week ahead, right now. I’m going to talk about my liberal politics a bit today, so you can stop reading right now and come back to visit me here another day. I was watching CNN last night and was lucky enough to stumble across Senator Clinton delivering her concession speech to all her supporters. I watched the speech very closely, and I felt a sense of great pride in seeing her ability to still hold her head up high after losing such a long hard competition. She and Mr. Obama have run a good race, but in the end he garnered enough support to pull just ahead. It could not have been easy for her to give that speech, but it was definitely something she needed to do. I would have expected Mr. Obama to do the same were he in her position. I sat here hearing her drum home her support behind Barack Obama time and time again and cringed every time I heard “boos” in the crowd. She talked about how the Democratic Party is like a family and how we need to pull together now to push towards a common goal and I couldn’t agree more. We are the underdogs, the minority voice, or the little guy against all those bullies out there in the world so lets put aside our slight differences. As I said, I heard a lot of boos from the audience to begin with and such was to be expected I guess after such a close hard race. Yesterday, I also saw a female Clinton supporter in New York tell a reporter that she would rather vote for McCain than vote for Obama. So, to all you would be turn coats out there in the Democratic party I’ve just got one thing to say. GROW UP! This sort of behavior reminds me of the kid who tips the game board over when they lose, or packs away their toys and go home. This isn’t chutes and ladders or Monopoly here and there is SO much more at stake than pride. After all, we are a like minded family and I’d hate to see the engine of bigotry win because of the loss of a little face. It saddens me to think that we couldn’t all pull together and work towards toppling this right wing regime currently holding the country in the iron grasp of bigotry. Gosh, you can almost see the Disney villain sitting back to smile and rub his hands together when I see us fight amongst ourselves like this. Enough is enough, so again I whole heartedly applaud Mrs. Clinton for taking this defeat in such a dignified way and making an effort to bridge the divide. Don’t turn your back on us now, because the common goals and dreams we all share are bigger and more important than your broken pride. Sooooo, let’s work together to put the bully out of the school house! Have a good week ahead, and I promise another dose of my usual rambling lightness in a couple of days. Thanks so very much for stopping by as always, and check back again in a couple of days if you feel so inclined. I’m off to enjoy my Sunday!